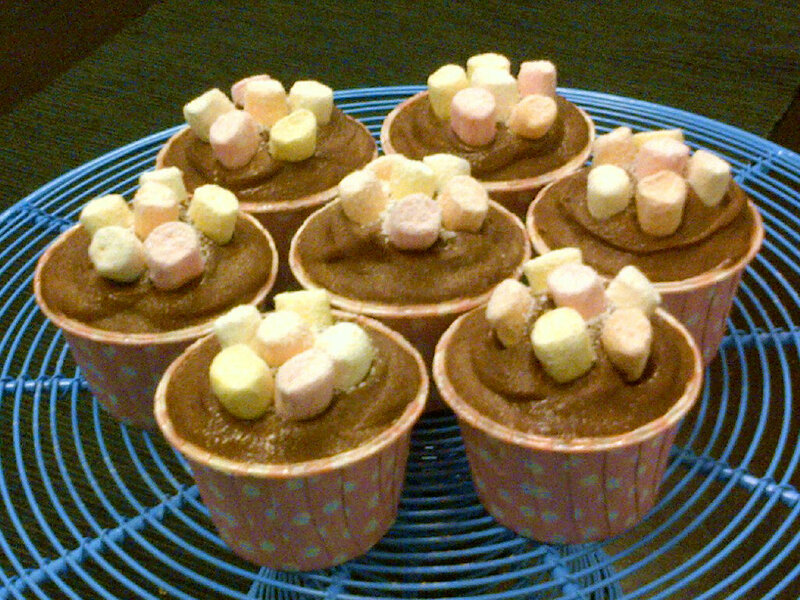 An easy all in one bowl chocolate cupcake recipe paired with a luscious, sinful Nutella butter cream frosting simply spread on and decorated with mini marshmallows. Pre-heat oven to 175 degrees Celsius. Line standard muffin tins with paper liners; set aside. Sift cocoa powder into a measuring cup, add coffee powder and warm water. Stir to combine into a smooth paste. Leave to cool. Sift together flour, baking soda and baking powder into a large bowl. Add sugar and salt. Stir to mix. Add buttermilk, eggs, oil, and vanilla to the cocoa and coffee mixture, stir to combine. Add wet mixture to dry mixture. Using handheld electric mixer on the lowest setting, mix until smooth, 1 – 2 minutes. Scrape down the sides and bottom of bowl to assure batter is well mixed. In the bowl of your electric mixer, or with a hand mixer, cream the butter , icing sugar, pure vanilla extract and Nutella until light and fluffy using the lowest setting to begin, gradually moving it up to the highest setting. About 5 minutes. The perfect chocolate cupcake. What exactly constitutes the perfect cupcake? I think the perfect chocolate cupcake is fluffy, light, soft and moist texture-wise, not too sweet (to allow for frosting) and it has to be intensely chocolatey. In my quest for the perfect chocolate cupcake, I’d done additional research and read that mixing cocoa powder with hot water would better bring out the chocolate flavour. I tweaked the Simple Chocolate Cupcake (1) recipe to make some birthday cupcakes for my sweet friend Cynthia. This would be my contribution to her little pot luck birthday party at another friend Charmaine’s home. The result was a slightly more chocolatey cake, a little lighter in texture than the Simple Chocolate Cupcake (1) which made it a tad better but it still wasn’t perfect. It’s a good thing there’s that Nutella frosting to save the day. 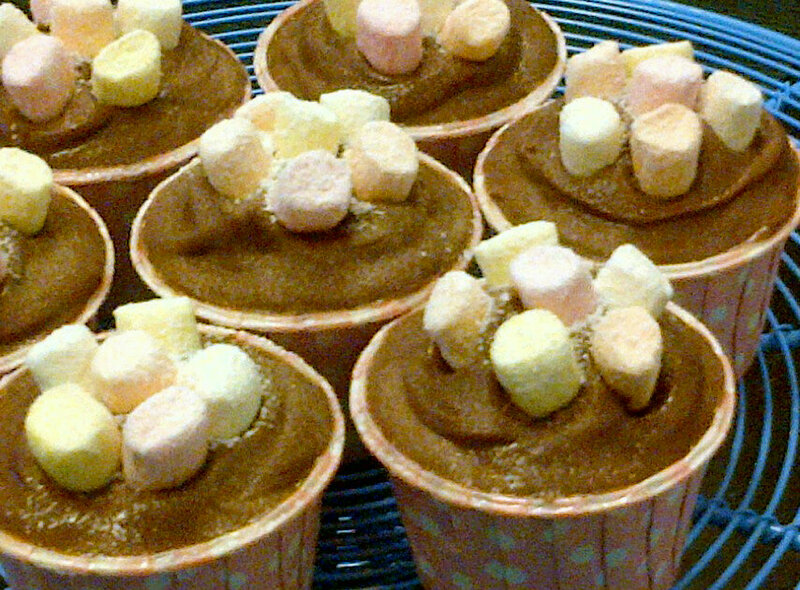 Baking them in pretty pink and white polka dot cups and adorning with mini marshmallows as well as a sprinkle of icing sugar after spreading on the Nutella butter cream made them almost too adorable to eat! Almost. I recommend eating these with a teaspoon. They can get quite messy. See recipe here. I received many sweet compliments at the party so that was a lovely reward for my effort. An easy dump everything in a bowl and mix chocolate cupcake recipe paired with a luscious, sinful Nutella butter cream frosting simply spread on and decorated with mini chocolate chips and little heart sprinkles. Sift together cocoa powder, flour, baking soda and baking powder into a large bowl. Add coffee, sugar and salt. Stir to mix. Combine buttermilk, eggs, oil, warm water and vanilla in a bowl or measuring cup, stir to combine. Add wet mixture to dry mixture. Using handheld electric mixer on the lowest setting, mix until smooth, 1 – 2 minutes. Scrape down the sides and bottom of bowl to assure batter is well mixed. You should get a rather liquid mixture. Divide batter evenly among muffin cups, filling each 2/3 full (transfer batter into a measuring cup with spout to make this easier). Bake until tops spring back when touched, about 20 minutes. Do not open oven door while cupcakes are cooking. Transfer to a wire rack; let cool completely.